Bucking the manufacturer's recent trend for adding subtly tweaked compacts to the burgeoning travel zoom area of the camera market, Fuji has instead gone for a complete design overhaul with the FinePix F770 EXR - its latest addition to the popular F-series. Boasting far more than just a few small enhancements and updates, the new model boasts a very sophisticated feature-set, headlined by a 20x optical zoom lens that offers an equivalent focal range of 25-500mm on a 35mm camera. As well as bettering the 15x zoom offering found on its predecessor - the Fuji F600 EXR - this move brings the new Fuji F770 EXR into line with its direct competitors: the likes of the Canon SX260 HS and Panasonic Lumix TZ30, for instance. Additional noteworthy features include Fuji's latest 16MP EXR back-side Illuminated CMOS sensor, Full HD (1080p) movie recording capability with high speed movie capture at 320fps and raw file capture, plus built-in GPS functionality and fast 11fps continuous shooting (8MP) - with more besides. The powerful performance that the Fuji FinePix F770 EXR promises is made all the more appealing when you factor in its price tag. With a launch price of £329.99 in the UK and $479.99 in the US, and a street price of around £299/$330, Fuji looks to have come up with a competitively priced camera that offers a number of advantages over its rivals. 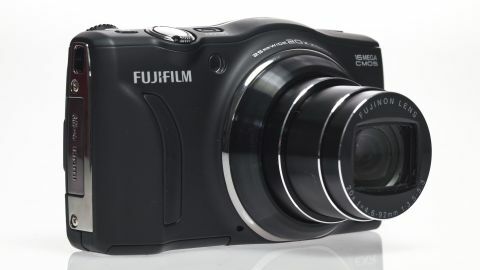 With little difference between the Fuji F770 EXR's overall shape compared to the older F600 EXR that it replaces, Fuji seems to have stuck with its tried-and-tested design, saving the bigger changes for the internal components and features, instead. A few subtle tweaks to the Fuji FinePix F770 EXR's profile include an enhanced front grip that provides a secure and comfortable grasp on the camera, coupled with an all-over soft-touch rubber finish that further augments this feature. Available in understated black or more striking red, white or blue, the Fuji F770 EXR is slim and stylish, with a well-designed interface that keeps its operation blissfully simple. Like its predecessors, the F770 EXR boasts a well-stocked mode dial that's mounted on a slant, abutting the top and back panels of the camera. Falling neatly under the thumb, the dial is a very welcome feature that provides a far quicker and more intuitive way of working than menu-based systems tend to offer, dispensing with the need for multiple button presses and scrolling through menus to find the setting you want. A dedicated movie button also gives fast access to the Fujifilm F770 EXR's Full HD movie recording feature, with softkey access to key functions provided by the scrolling four-way d-pad, plus Fuji's 'F' button offers a concise on-screen menu that presents you with additional important functions for fast tweaking on the fly. Both the latter contracted 'F-mode' menu and the main menu system are clear, easy to read and logically laid out, with the number of options available for adjustment expanding or contracting according to the exposure mode you're working in at the time. Stick to the automatic shooting modes and you'll have fewer options to change, while switching to any of the more advanced modes broadens the level of scope for manual control over settings.